Know the famous dishes served in Indian homes and restaurants widely, and don’t forget to taste these cuisines on your trip to the country. 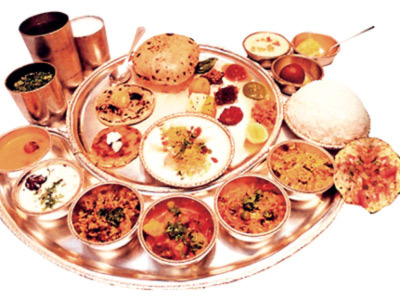 Apart from culture and tradition, India is also known for its scrumptious dishes. Indians are popular world over for eating every taste – sweet, spicy and tangy. Our idli and dosa from south, dum aloo and kareli ke loungi from north, daal baati and chorma from west and Roshogolla from the east, are world famous for their taste. Biryani – Biryani is a rice based dish that is made combining different spices making it a little spicy to eat. Non-vegetarian biryani includes egg, meat, fish or chicken. While vegetarian Biryani includes vegetables and curd. Kashmiri and Hyderabadi Biryani are popularly served in almost every restaurant in India, irrespective of the class of the hotel. Chicken Tikka Masala – A delicious dish, Chicken Tikka Masala is famous among non-vegetarian Indians. This scrumptious dish consists of pre-marinated pieces of chicken that are grilled. These grilled pieces are then added to thick creamy gravy, which is not too spicy but tastes heaven. Chicken Tikka Masala is certainly recommended for non-vegetarian food lovers. Chole – A pure vegetarian dish served originates from North India, and today served in every part of the country. The piping hot Chole is served either with puris or bhatooras. Chole is basically served best in North India restaurants with onion, lemon and coriander leaves used for garnishing the dish. Palak Paneer – Palak Paneer means spinach with cottage cheese in English. This mildly flavored dish is considered to be the healthiest dish served in India. Palak Paneer is mostly enjoyed with piping hot puri or roti. It is a famous North Indian dish. Rogan Josh – This dish comes from Kashmir. Rogan Josh means red lamb. The red hot dish gets its bright red color because of the dry Kashmiri chilies used in it. The dish is loved by all non-vegetarian buffs in India. If you like non-veg items, you must try this dish. When traveling to India don’t forget two things – India visa and the taste of Indian dishes. Visa for India must be applied in advance of your trip. It is a mandatory document.